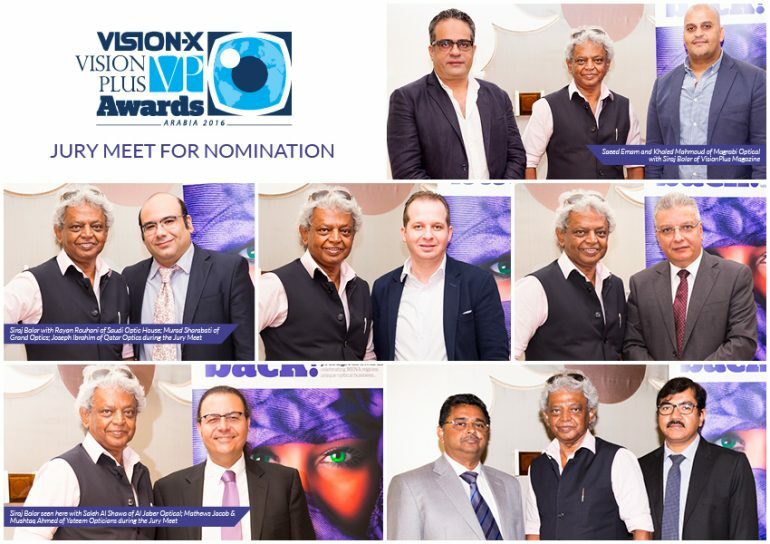 VisionPlus (VP): What are your expectations from the Vision-X VP Awards 2016? Saleh Al Shawa (SS) : As compared to the last two years, I do hope to see a bigger and better presentation this year. As always, this year too we have seen some big names on board in terms of participation. The addition of new categories and improvement in products simply shows the growing radius of Vision-X VP Awards. VP: What is your opinion about the collections this time? SS: We saw some new innovative designs and different materials being used, which is good. Different brands are trying to reinvent and come up with something new which I think is the need of the hour as per the growing consumer demands. Fresh new colours, new materials and new designs were surely the eye-catchers this time. VP: Any category that has caught your attention? SS: New categories for this year’s Vision-X VP Awards helped differentiate products better. I see a lot of competition in the luxury category. As compared to the other years, this year participations from reputed brands have added more credibility to the awards. VP: Do you think there is a retail slowdown? SS: With the situation worldwide, it is not just a matter of slowdown. For us it’s a challenge. And this challenge can be met with creativity. Now, we are seeing that it’s not important to just sell expensive eyewear, rather it’s important that you talk to your consumers well. Show them different eyewears in affordable categories and convince them to buy and to come back again. VP: What is expected of the 2017 trends? SS: For sunglasses, certain models from different brands are trying to bring back the retro trend. Eyewear models that were a hit during the 60s and the 70s are being brought back with the use of different colours and materials. Additionally, more focus is given to certain models that were doing very well in the last couple of years. Saeed Emam (SE): The Vision-X VP Awards keeps getting better with each passing year. The event was organised very well last year as compared to its debut in 2014 and this year too I’ve seen a positive response in participation. Also on a personal note, I really enjoyed the Gala Dinner last year and I am hoping for the same this year. SE: The eyewear industry is growing and with it we see the increase in participation. It’s hard to miss that big brands have come up with a lot of new collections. Colour looks like the trend in eyewear and the colourful eyewear models were very attractive. Besides this, I was happy to see that the eyewear models are not repeated in this year’s collections. SE: I am certain there is some change in the customer behaviour. E-commerce surely affects the business in some way or the other. If we talk in terms of percentage, then the effect of e-commerce differs from company to company. Change in the sunglass category is also noticed. give the customer a good buying experience so that he can come back and purchase again. SE: As a trend, I feel mirrored lenses are making a return in the market again. This is in fact a five-year-old trend that has surfaced again. The consumers are reacting positively towards this trend with many of them asking for more shiny and mirrored lenses. They want more colourful and simple design these days. As for the material of sunglasses and optical wear, 80 percent acetate and 20 percent metals will continue till the end of 2017 for sure. Mathews Jacob (MJ): The Vision-X VP Awards function has been well organised for the last two years and I am sure it will continue to be so this year, as well as in the years to come. More optician participation is requested for the event. (MJ): The Vision-X VP Awards platform surely recognises best product(s) from each category. What is great to see each year is the consistent improvement in the participation in terms of design and quality from various global brands. Mushtaq Ahmed (MA): This event is a fabulous effort that uplifts the eyewear industry and encourages the market to participate in activities and categories of the awards. Vision-X VP Awards is a learning platform that highlights the growth in the market. (MJ): It is always great to know about new brands and new products of this industry. This time around I saw some eyewear models that were really good. The innovation seen in the products this time will surely be accepted by the customers. (MJ): For prescription eyewear, I think the market is doing well and it will continue to flourish. When we come to sunglasses, with the growing demands of the consumer, I think the eyewear makers have also started becoming more cautious about the collections they release. MJ: The trend earlier was more focused on eyewear temples. We are already seeing the shift and eyewear designers have started concentrating to the front part of the eyewear as well. In 2017, we’ll see more decoration on the front of the eyewear. As for lenses, flat based lenses for sunglasses will definitely be trending. Rayan Rouhani (RR): I expect that the Vision-X VP Awards continues to grow and develop so that the industry is constantly encouraged. It is a tool to bring and make the public and the industry aware of the different designs and different categories. I think the event this year will play a very positive role for the industry. It will also inform the people about the quality and excellence in the optical sector in this region. RR: There were quite a good number of collections this year as well as introduction of some new categories. The participation seemed positive this year, with many brands and new collections that really impressed me. RR: Each year the Vision-X VP Awards witnesses great products and this year too we saw some great stuff. All the frame categories presented high standards. But for me, I think the luxury sunglasses were really surprising and very good this year. RR: I see the trend for 2017 to progressively develop. I do think there will be an addition of exciting new materials and that will make the eyewear collections look exotic. We will also see some increase in the use of brighter colours in eyewear. Joseph Ibrahim (JI): Vision-X is the only exhibition in this region and the Vision-X VP Awards is a platform that brings together the best brands of the industry. Additionally, the competition amongst designers and manufacturers is a healthy way to encourage new ideas. JI: I am impressed by the collections. They are more fashionable and trendy. Though I think we should focus more on ophthalmic lenses and the technology behind it. Sure, we should not ignore the fashion and the trend but we need to highlight the technology of the ophthalmic lenses. JI: I really liked the entries. I think the Vision-X VP Awards presents a great insight for everyone in the industry and I am happy to be a part of the jury panel and this platform that aims at moving the industry forward. JI: When we are facing some economic issues, one can anticipate a bit of a retail slowdown. This will definitely reflect on the consumers, so they’ll be more careful while buying and spending. For instance, someone who would buy an eyewear for a thousand dirhams, would now rather opt for something that costs around five hundred dirhams. Having said that, there is still a category of customers that don’t compromise and they will spend, especially if they love what they are buying. JI: We are looking into fashion-forward and more trendy sunglasses in the year 2017. Eyewear designers are going wild in terms of their innovation concepts. Although, I feel, for the ophthalmic frames, the classic styles will continue to trend. Sure even in this category, there is a percentage of customers that request to own a trendy or fashionable eyewear but it’s a very small percentage. Today, customer demands for stylish and more innovative sunglasses. Out of the ordinary and in with the trend, is what I think the eyewear collection will move towards. Murad Sharabati (MS): As I wasn’t in Dubai last year I missed the Vision-X exhibition but I heard good things about it and also about the Vision-X VP Awards, and I hope the same for this year too. Such functions are of great value to the industry in the Middle East region. MS: The entries this year are good in terms of the industry growth. Brands have added new models and new material with different features to their collections. And I think some of these eyewear models will be a great success in the market. MS: Yes, there are some brands that are changing the direction and making something more commercial that will be easy to sell. Like the Jackson model by Chloé is suitable for the likes of fashion-forward ladies. We see that brands today know the customer well and thus are designing eyewear that will be best suited for them and of course loved by them. MS: I don’t think the market has slowed down but I think retailers must lower their expectations. They need to start understanding what the customer really needs and implement them to their business. When we talk about opticals and their accessories, it is a must to assess the supply of good quality products to the customers. MS: The trend for 2017 in eyewear material will be acetate and metal. Also, I think that gradient lens will be more in fashion. Colourful lenses is another feature that will be the trend for 2017.